Sometimes the small things make a big difference. These simple additions to the kitchen save space and help with keeping everything neatly organized. When it comes to organizing the pans the options are two: hang them off the ceiling or store them in a cabinet. The ceiling option has the advantage of keeping the pots within easy reach but is not the most eye pleasing. 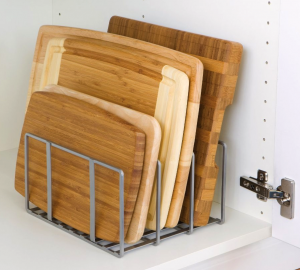 We found a couple of neat ways to keep the pans out of plain sight but still organized. The J.K. Adams Bar Pot Rack is actually designed for mounting on the ceiling but can be mounted inside a cabinet. The hooks are gliding and therefore the rack can accommodate pots of varying sizes. 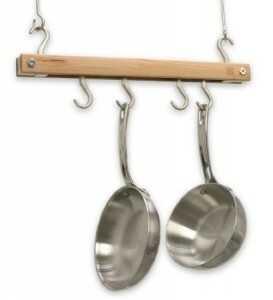 It is 20″ long and comes with 4 hooks for pots plus two for hanging the bar. The top two hooks can be used for hanging pots as well if the rack is mounted under a shelf. For this type of mounting you have to drill holes through the shelf and use carriage bolts. If your pots are slim you can buy additional hooks as well. J.K. Adams also makes a longer version of the rack (36″) which has to be trimmed to fit standard size cabinets. Another option are the Rev-A-Shelf solutions. 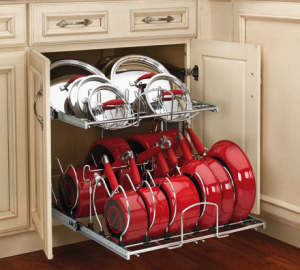 Rev-A-Shelf offers cookware organizers for both pans and lids. 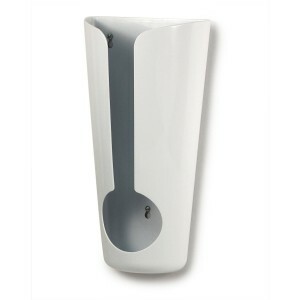 The model shown here can be installed in an existing two-door cabinet with minimum dimensions 20-1/2″W x 22-1/8″D x 22″H. But to be on the safe side make sure that your cabinet is larger. The organizer itself is 20-3/4″W x 22″D x 18-1/8″H. For narrower cabinets it is available in 11-3/4″ width. The default mounting is at the bottom, back and sides, while the door mounting is an option. The two tiers move independently and the whole system is very stable. 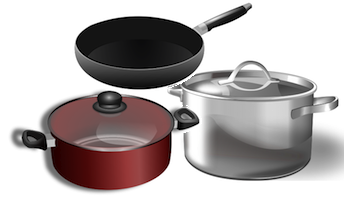 The best feature is that the dividers can be adjusted to accommodate different sizes of cookware. Just don’t try to cram the pans too tightly; leave some space for each pan to be moved easily in and out. The plastic clips used to attach the separators can be broken if the pans fit too snugly and constantly put pressure on them. Storing cutting boards and cookie pans vertically may not save on space but definitely saves on effort. 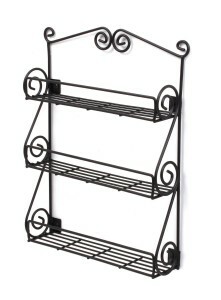 This free-standing organizer may be used inside a cabinet or directly on the countertop. It has the advantage over similar organizers of not being permanently mounted to a cabinet. It is very versatile and can also accommodate pyrex baking pans and lids. Made out of iron it is very sturdy. 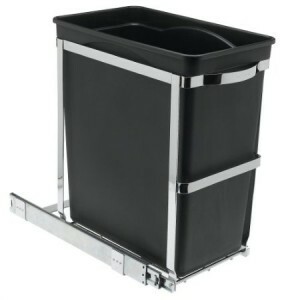 When researching similar organizers keep in mind that there are plastic ones as well. In many cases those are rather flimsy. The trash can under the sink saves space and hides the trash. There are other models but luckily we chose this one by SimpleHuman 7 years ago. The system is sturdy and well made. The can does not wobble because it is sitting in a metal holder. It glides perfectly in and out. The can is not enormous but just the right size. We use 13 gallon tall kitchen bags for it. Being under the sink and open it needs emptying twice a week. The installation is easy and fast. Just make sure you get separate stainless steel screws because when there is a drip under the sink other screws will rust. We needed to replace the drain recently and had trouble removing the rusted original screws. We have a second such trash can for recycling. They both fit under our sink. A two can design is also available. When you are collecting grocery bags for other uses the bag dispensers are very useful. This simple Spectrum grocery bag holder may not be the most elegant looking one but is the most functional. It is very easy to stuff the grocery bags and also very easy to pull them out from the top. Other bag holders have issues with both. This one can be easily mounted on a cabinet door in the kitchen or on a wall in the pantry. It may look like a small thing but it makes a big difference. We had our bags in one bag and they kept falling out. We put them under control after we bought the holder. You can also see the other types of grocery bag dispensers on Amazon. If you don’t already have a spice rack build in your kitchen design there is an elegant and easy solution. This spice rack can be mounted on the wall under the cabinets. It saves cabinet space and displays the spices in an easy to reach place. Each of the 3 shelves can store 6 McCormick size spice jars. Taller jars can be stored on the top shelf. There are many other spice racks available. 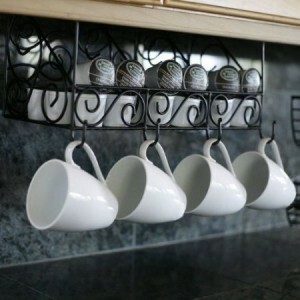 Hanging cups and mugs on hooks provides a neat solution for maximizing cabinet space. It can be done simply by screwing hooks under a cabinet shelf. Or even faster by just sliding a metal rack over a shelf. Another option is to have the mugs within easy reach. This under-the-cabinet storage system allows for easy access and also looks great. It can be combined with the spice rack above.